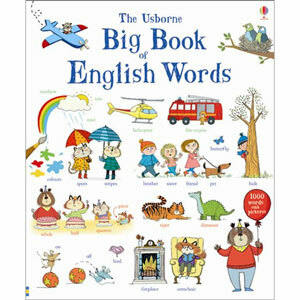 The Usborne Big Book of English Words is a large format board book for young children. Children will have fun learning their 1000 first English words, by looking through the thematically-arranged pages. Each page has a large, busy scene with objects labelled with their name in English. There is a word-list at the back of the book and children can listen to all of the words read by a native English speaker on the Usborne Quicklinks website. The Usborne Big Book of English Words is aimed at children age 5+ (Key Stage 1 & lower Key Stage 2). It is suitable for both children learning English as an Additional Language (EAL), or for native English speakers learning to read.